If you are still struggling with your handstand push ups, then these progressions and tips will help you nail them in no time at all! The handstand push up can be performed, like pull ups, in a strict or kipping movement depending on the standards of the workout. As with all Crossfit exercises, concentrate on the strict version first. Build the necessary skill and strength that is required for the harder version before you even start to think about kipping. 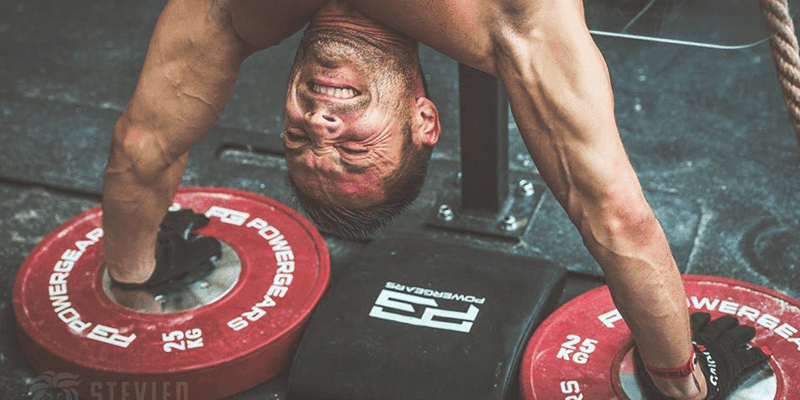 Check out these tips and progressions to help you rep out handstand push ups easily and efficiently whenever they crop up in workouts. These options will allow you to scale handstand push ups when they appear in workouts. If you can already do a handstand push up, then skip forward to the technique tips section. The following methods begin with the easiest and progress towards the most difficult. If you work your way through them, you will gradually develop the required strength, skill and coordination. Start in a regular push up position. Walk your feet forwards so that your bum raises up into the air and your body resembles an inverted V. Whilst keeping your core tight, spine neutral and legs straight, perform a press up by lowering your head to touch the floor then fully extend your arms once again to complete one rep. This is the same as the previous exercise, however place your feet on a plyo box so that more pressure is placed on your torso, shoulders and arms. Perform reps as above. Position your hands in the starting position. Lead with one leg and jump off the standing leg as you propel your feet toward the wall. It may take a few kicks to stick. Don’t be afraid to overshoot it at first. The wall is there to catch you. Once you are in the handstand position, spread your finders and control the weight of your body. Start by holding this position with as little movement as possible. Once you can manage 30 seconds then it is time to move onto the next scaled exercise. Once you feel confident with these scaled options, try a negative handstand push up to get your body used to kicking up into the starting position and being controlled whilst upside down. Kick up into the starting position with confidence. Propel your legs with force and support the weight of your body on your hands. Gradually lower yourself downwards until the top of your head touches the floor. Stay in control of the movement. For this version, prop an ab mat on a book or plate in order to reduce the full range of motion of the exercise. This will allow you to build up over time and get used to the feel of pushing your body upwards and balancing at the same time. Place your hands about a foot away from the wall. Too close and the movement becomes harder to coordinate and easier to fall off balance. Too far away and you will put your body in an inefficient position to perform the full range of motion. In competition, you may be forced to have your hands in particular positions, so it is worth practicing with your hands very close to the wall. This makes the exercise much harder, but it will also make you stronger and more coordinated. If you are having difficulties, point your thumbs inwards towards the wall. This will help to place greater load on the triceps, and will take some of the pressure away from your shoulders. Keep your belly, glutes and core tight because this will help to stabilise your movement. Try the following exercise from Camille Leblanc-Bazinet for a great way to pinpoint your centre of gravity whilst upside down. Working on strengthening your core strength is ALWAYS a good idea and will have huge positive repercussions throughout many other exercises in Crossfit, as well as in your daily life. Keep your elbows in, and point them out in front of you. Think about when you jerk or overhead press, the movement is much more efficient with the elbows facing forwards than out to the sides. The same is true for the handstand push up. Concentrate on pointing them out in front of you, directly away from the wall. Are there any other tips or scaled progressions that you use to improve your handstand push up technique? Let us know in the comments section below.